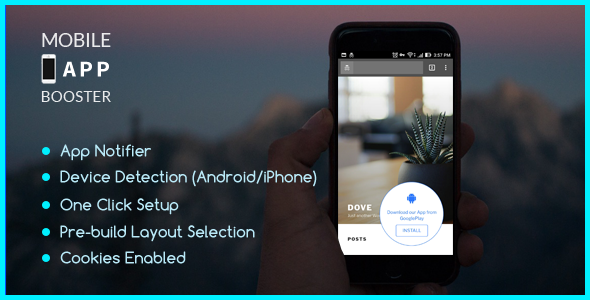 Mobile App Booster is a plugin for WordPress users who want to implement Customised Google Play Store / iTune App Installer Notifier / Popup on your website. - Mobile Auto Detection (Android / iOS) Accordingly shows the Installer Popup - Control what to show and when to show to a user. 1) Show to : Guest / Logged in / All Users 2) Display in : Home Page, Blog Page, All Pages or Short Code Only 3) Display settings like Sticky Top / Bottom, Fixed Top / Bottom, Hover icon etc. - Cookies Enabled to Set Expiry Time. 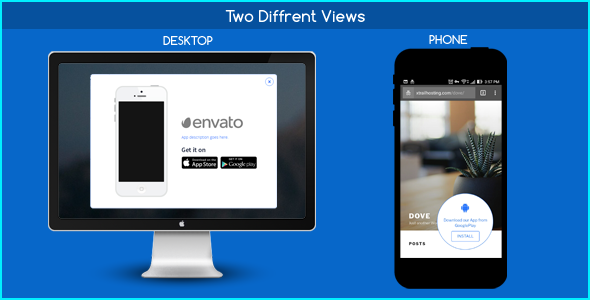 - Different layouts for Mobile and Desktop. - Easily Customise Title, Descp, Google Play App URL,iOS App Store URL. - 1 Desktop layout & 4 Mobile Layout to choose from, more layouts coming soon. - Choose your own Font Color.